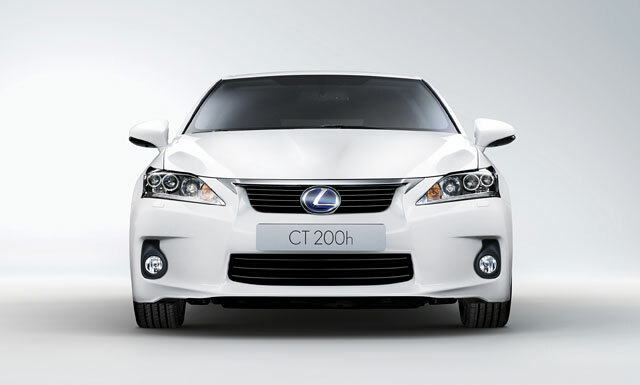 The new Lexus CT 200h is the first full hybrid vehicle to be launched in the premium compact segment. Entering production in late 2010 and set for sale worldwide, the full hybrid model will provide a new gateway to the Lexus range and attract new, younger customers to the brand. The CT 200h was designed and developed with the European market in mind. Lexus’s first five-door compact car, its size, packaging, full hybrid technology and low emissions fully address the requirements of discerning, environment-conscious customers in a key market sector. At the same time, it does not compromise the quality, refinement and driving pleasure that are the hallmarks of every Lexus. The production-ready CT 200h retains strong visual links to the LF-Ch concept Lexus unveiled at the 2009 Frankfurt motor show. Its styling marks a powerful evolution of Lexus’s L-finesse design philosophy with a distinctive, sharp-edged look that sets it apart from its premium compact rivals. The exterior is styled for maximum aerodynamic efficiency and minimum wind noise. The strong front grille, directly referencing the LF-Ch concept sits over a full-width bumper and air dam. The headlamp units, positioned higher than the grille (a signature feature of L-finesse design), incorporate LED daytime running lights. In profile, the steeply raked windscreen, long, flowing roofline and Lexus slingshot window graphic combine to create an elegant and distinctive silhouette. The front and rear corners have been pulled in tight and the wings are styled to improve airflow down the sides of the vehicle. At the rear, the trailing edge of the roof overhangs a wide, wraparound rear window to create a seamless, integrated spoiler. A pronounced step in the tailgate section flows from the shoulders of the rear wheelarches and is anchored by a tail lamp design that displays the L-shaped motif that Lexus first introduced on the current LS model. The interior combines superior ergonomics with extensive use of metallic finishes and dark, soft-touch surfaces. Lexus has retained the asymmetrical dashboard design seen in the LF-Ch show car. Based on the Future Lexus Interior concept, the dashboard is split into an upper Display Zone, with an eight-inch LCD multi-display screen; and a lower Operation Zone, with the shift lever and other controls such as Lexus’s Remote Touch multi-function controller. In keeping with the car’s performance, the driving position is set low, with a highly supportive driver’s seat. The instrument binnacle houses large, twin dials; in SPORT mode, the hybrid indicator in the binnacle functions as a tachometer and the ambient lighting turns from blue to red. The two-mode switch ring and a spotlight in the centre cluster also light up in red, changing the whole atmosphere of the cabin. In spite of its compact, efficient design, the CT 200h offers a roomy interior. The 2,600mm wheelbase allows for front and rear passenger accommodation that is among the most spacious in the segment. Luggage capacity is 345 litres, increasing to 700 litres with the rear seats lowered. The Lexus Hybrid Drive system in the CT 200h combines a 1.8-litre VVT-i petrol engine with a powerful electric motor. Drivers have the choice of four selectable drive modes: ECO and NORMAL place the emphasis on efficiency and comfort, while SPORT focuses on dynamic performance. Unlike mild hybrid systems used by other manufacturers, the CT 200h also has an EV (electric vehicle) mode that allows for ultra-quiet running on the electric motor alone, resulting in zero fuel consumption and CO2, NOx and particulate emissions. The car is capable of running in EV mode for up to 1.2 miles at speeds up to 28mph. The CT 200h is built on a new platform with a dedicated double wishbone and trailing arm rear suspension system. It has been developed specifically to combine the ride comfort expected of a Lexus with superior driving involvement and handling agility. Several elements in the MacPherson strut design have been exclusively developed for the mode, including the coil springs and shock absorbers, and a new front anti-roll bar has been designed to deliver improved roll rigidity. The double wishbone rear suspension is exclusive to the CT 200h and incorporates a lightweight trailing arm. The springs and shocks are positioned separately to minimise intrusion into the loadspace floor.